When you fly for business, your Company could enjoy Double Aquire Points1 on eligible flights with Qantas2. Unlike other corporate card programs, you can choose how your company is rewarded – Double Aquire Points1 or a Qantas Rebate3 – both of which can turn your everyday business travel expenses into savings4. What's more, business owners, employees or individuals who are Qantas Frequent Flyer members will simultaneously earn Qantas Points5 as they would normally and Membership Rewards points6 if enrolled in Membership Rewards Spirit. could be a richer reward option for your Company, if your annual Qantas spend includes domestic and international Qantas flights, across all fare categories and includes Qantas 'QF' International flights operated by Qantas, Emirates or American Airlines. could be more rewarding for your Company if your annual Qantas spend is predominantly on flexible Qantas domestic and trans-Tasman flights. Regardless of which reward option you choose, if your Company is a member of Aquire, employees travelling on eligible Qantas flights2 could earn Aquire Points for your company, that could turn everday business expenses into real rewards4. American Express, you could earn Double Aquire Points on eligible Qantas flights2. Watch the short film to see what Graham Hardy, Managing Director of DesignStreet, thinks about Double Aquire Points. As well as a choice of rewards, the American Express Qantas Corporate Card program has been designed to drive end-to-end efficiency and savings. You'll enjoy features such as extended cash flow with up to 51 credit free days9, and have access to reporting tools that summarise all aspects of your Corporate Card Program giving you greater insights into your business expenses. Your business must be an Aquire Member to earn Aquire Points. Fees may apply. Aquire membership and Aquire Points are subject to the Aquire Terms and Conditions available at aquire.com.au/terms. The Double Aquire Points offer is to match the number of Aquire Points otherwise earned for Eligible Flights with Qantas under the Aquire Airline Reward Scheme terms and conditions available at aquire.com.au/terms#airlineterms. Minimum points for redemption and maximum earning cap applies. These additional points will accrue to the business's Aquire account once the Aquire Member has advised American Express of the registered ABN, American Express has validated the Aquire Membership and the Eligible Flight has been flown. Initial Double Aquire Points will be allocated to the Aquire Member's activity statement within six months and monthly thereafter. Businesses that choose to keep an existing rebate, corporate fares agreement or other discount arrangement with Qantas and travel agents are not eligible for this offer. Other exclusions may apply subject to the Airline Reward Scheme Terms and Conditions, visit aquire.com.au for full terms and conditions. For full Double Aquire Point program terms and conditions, please click here . An eligible flight means a domestic or international flight which has a Qantas 'QF' flight number on the ticket that is purchased in Australia; is operated by Qantas, Emirates or American Airlines; has a ticket number commencing with '081'; and is booked and travelled for business on or after the date the business registers for Aquire. Exclusions apply. We recommend you consult your accountant or tax adviser to ensure you understand possible tax implications, for example fringe benefits tax (if applicable). 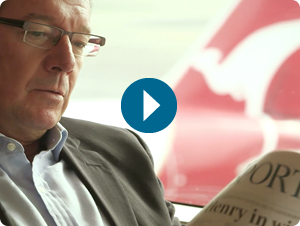 Qualifying businesses could earn Aquire Points every time their employees fly on eligible Qantas flights for business purposes, while the employee continues to earn Qantas Points as they normally would. Minimum earning thresholds and eligibility conditions apply. Visit aquire.com.au/Qantas. Membership Rewards Spirit enrolment required (an annual fee applies). Subject to the Terms and Conditions of the Membership Rewards Spirit program available membershiprewards.com.au Company must allow participation in Membership Rewards to be eligible to enrol. Enrolment to the program is not automatic. You must enrol yourself and cannot delegate someone else in your Company to do so on your behalf. There may be tax implications associated with your participation in the Membership Rewards program. You are advised to check with your accountant or tax advisor for further information. You must be a Qantas Frequent Flyer member to earn and redeem Qantas Points. The redemption of Qantas Points is subject to the Qantas Frequent Flyer program terms and conditions available at qantas.com/terms. A joining fee may apply. We recommend you consult your accountant or tax adviser to ensure you understand possible tax implications, for example fringe benefits tax (if applicable). The Offer commences at 9.01am AEST on 07/04/2014 and ends at 11.59pm AEDT on 31/03/2015 ("Offer Period"). For Prospective Customers, the Offer is only open to residents of Australia aged 18 years or over who are employed by an organisation, (Australian Company, Partnership, Registered Foreign Company, Unregistered Foreign Company, Government Body, Co-operative, Incorporated Association, Unincorporated Association, Trust) with a valid ABN with an annual turnover of AU$2,000,000 per annum or more. To be eligible for the Offer, Prospective Customers must choose between Double Aquire Points or a Qantas Rebate and apply for the American Express Qantas Corporate Card program by 11.59 PM AEDT 31/03/2015, be approved to join the program and make 1 transaction with Qantas on the American Express Qantas Corporate Card within the first 3 months of Membership. Eligible Participants who have chosen Double Aquire Points as their Company-level Reward option and fulfil the criteria above will receive 40,000 bonus Aquire Points. Bonus Aquire Points are subject to Company enrolment in the Aquire program. Aquire annual membership fee applies. Bonus Aquire Points will be awarded after the business has advised American Express of the registered ABN and American Express has validated the Aquire Program enrolment with Qantas. Eligible Participants who have chosen the Qantas Rebate as their Company-level Reward option and fulfil the criteria above will receive 40,000 bonus Qantas Points. Bonus Aquire or Qantas Points will be allocated to the customer's Aquire or Qantas Frequent Flyer account up to 90 days after 31/03/2015. Actual credit-free period will vary based on the date of the charge and the billing cycle cut-off date. Earn Double Aquire Points1 when your employees fly on eligible Qantas flights2 for business, paid for with the American Express Qantas Corporate Card. Convert your Aquire Points to Qantas Points (to any Qantas Frequent Flyer account) at a rate of 1:17 and use them for flights, upgrades, employee rewards, or to shop at the Qantas store. Up to one million Double Aquire Points apply per member for each Membership Year1. Business owners, employees or individuals who are enrolled in the Membership Rewards Spirit program will simultaneously earn Membership Rewards points6 which can be transferred to Qantas Points. To receive your bonus, simply apply and be approved before 31 March 2015, and make a transaction with Qantas in the first three months of Membership. To learn more about the American Express Qantas Corporate Card program, please complete the enquiry form and an American Express Representative will be in touch. Alternatively call 1300 729 093 to speak to a Representative now. You will receive 2%-5% of your annual spend on qualifying flights with Qantas3. Your Rebate will be up to the value of $50,000 a year, paid twice annually. Make significant savings to your bottom line. 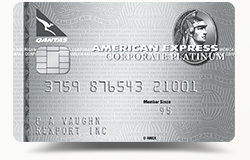 How did you hear about the American Express Qantas Corporate Card program? Are you a 'Sole Trader'? Thanks, your details have been passed on to a member of our team. Expect a call soon.